Define the informal learning space where badges can play a role for identity, process, participation, achievement, etc. Foreground the educational outcomes over the technical whizbangs. How can others learn from your badges? What can badges tell us about who we want to be (model identities)? How do I see patterns in other people’s careers [badge collections]? How do I learn from that? Is the assessment [criteria] public? 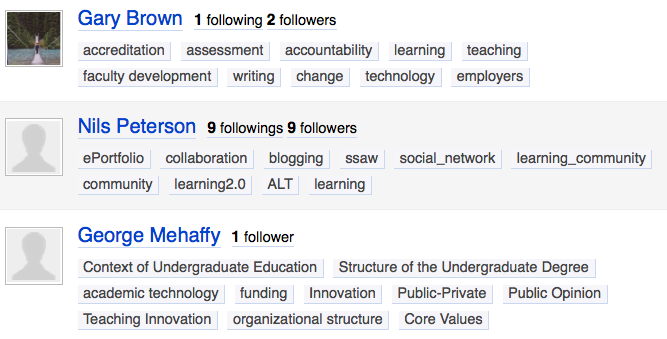 [Badges should be] Pedagogically agnostic: but can there be values? [Possible values might be:] Language and culture, building the tools, and building the community. Are there different badge considerations for different ages? How can one sytem support life-long learning? Are we scoping badges just in the learning and EDU context? What makes a good badge system? How do you know if you have a good badge system? How are assessment criteria made public? Do peers learn from doing assessments? Does system record what learner is =NOT= good at doing? Is the system used for long periods in [the learner’s] life? Does user advertise their badges in Facebook, etc? Does the system have a user community? Does it have learners using it? Does it have robust assessors? Is awarding of badges automatic or does it require human judgement? Are badges better to mark a learning process completed or an assessment passed? I just spent 2 days at a meeting hosted by P2PU to talk about badge systems. The meeting used some “unconference” techniques. 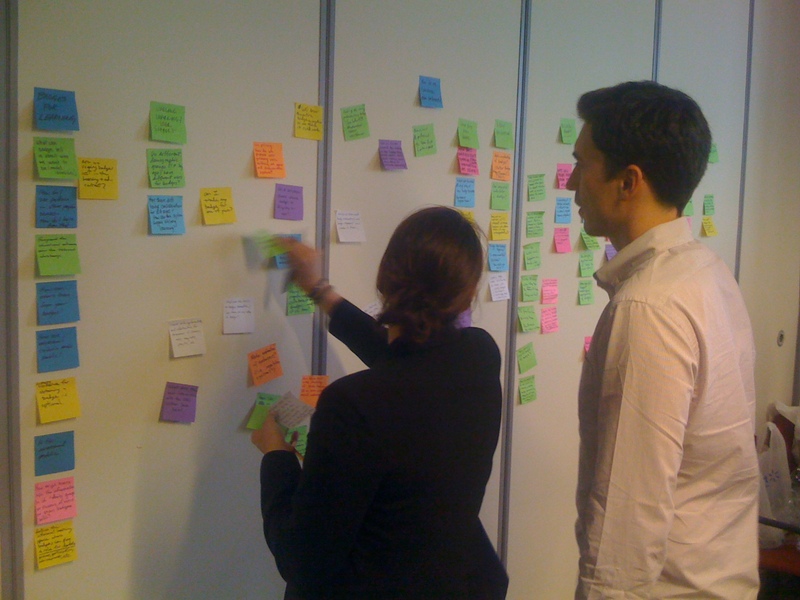 One activity, early on, was to work in pairs and create Post-it notes with a question, or statement, about badges, e.g., “allow badges to operate as reputation currency.” People were encouraged to generate as many stickies as they wanted. Each team had a different color stack of stickies. Later the first afternoon the conference organizers picked 3 of the groupings and invited the audience to divide itself among the 3 topics, nominating a facilitator for each. 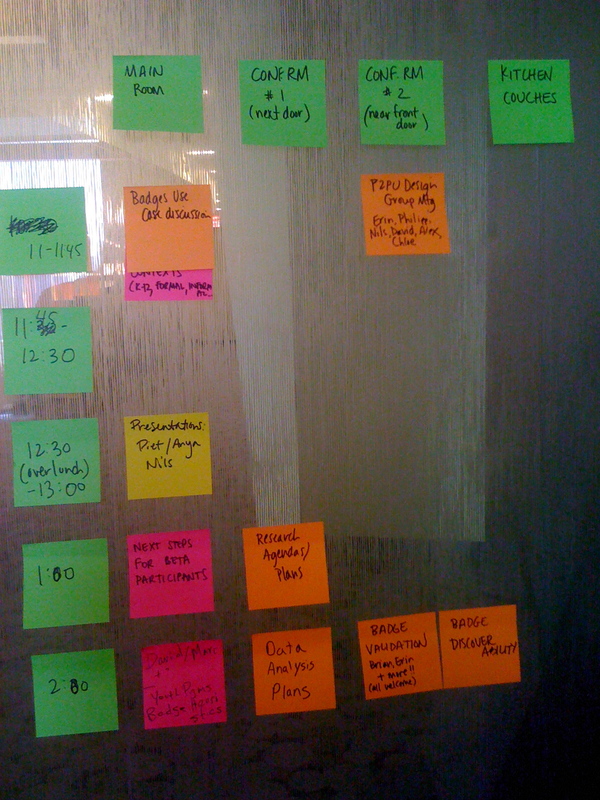 On the second day, the organizers posted a grid (rooms and times) (photo 3) and posted a few events into the structure and invited others to post events (which were drawn from the groupings from the previous day). This formed the agenda of sessions for the 2nd day. At the urging of Karen Lewis (“you need a web page”) and after checking around and having the real estate broker alert the property owner, I launched SODO Moscow site. You can learn more about SODO there. 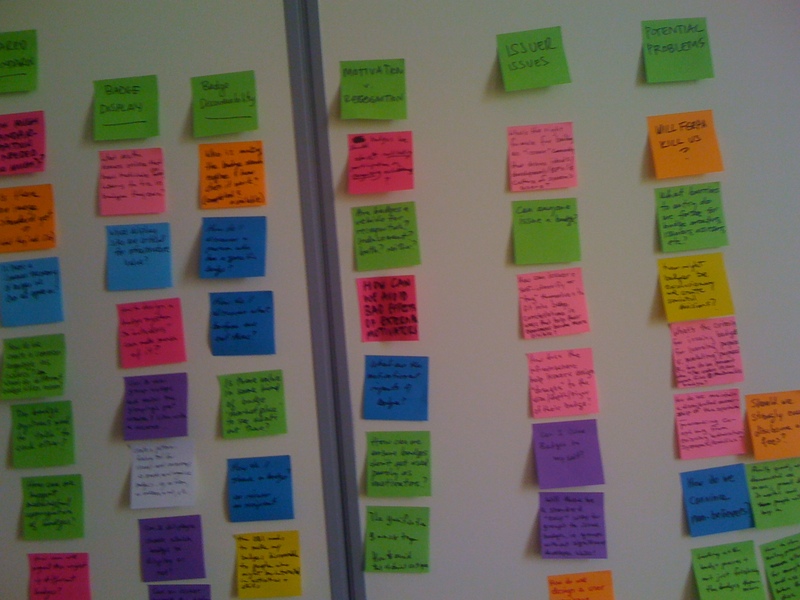 This post is a place to pull together my web strategy thinking. Karen’s suggestion to work in public fit what I had been learning at WSU in my work with student ePortfolios (see Learning Portfolio Strategy: Be Public). Another part of working in public is to work where the community interested in your problem is already working. For this project, Facebook seemed a logical place. I created a FB group SODO Moscow after exploring the idea of creating a new FB account and using its personal page or creating a FB page. I choose the group approach because it seemed to allow its members the most equal footing in a collaborative space. One of the things we learned at CTLT was that a learner’s portfolio needs to deliberately build “Google Juice” around its problem to attract a community of collaborators (why else work in public?). The decision to use Facebook worked against gaining Google Juice, because Facebook is a private island that Google does not index. The SODO Moscow blog in Blogger was chosen as a Google friendly place to be the public anchor for the project. I looked at a couple Twitter-centric tools with the thought that the audience can readily come prepared to Tweet from a range of mobile devices. What is needed is a cloud of the tweets @UserID and some coaching for the audience to tweet with tags. tweetcloud.com/ embedded in their web page. I used @nilspeterson as a search and it says there isn’t a cloud. mytweetcloud.com/ will get the hashtags from a user ID. UserID nilspeterson worked, This is getting the content that the user tweets, not what is tweeted @UserID. wordle.net will take the RSS from Yahoo and makes a handsome display (below). The @UserID comes thru big (duh! ), but this might not be a problem — it documents who is getting the feedback. The StopList is hardwired and can’t have any additional words added, so blocking the @UserID would need to happen in Pipes. Wordle requires using it on their page (a setup issue and no embed), they say You may not copy or redistribute the Wordle applet itself under any circumstances. Refreshing the page is a pain and not practical. Need another tool that can imbed. IBM ManyEyes won’t work because you need to upload a static dataset to them. www.tag-cloud.de can create an embeddable Flash from the feed. It makes a pretty handsome cloud, and in you can link from words in the cloud to web pages., but they process the tags in the URL once so the resulting cloud its static (no auto updates unless you do it on their site). Diverse Group Tag Cloud (DGTC) is a WordPress plug in. Its not certified in version the version 3.x of WP used by NilsPeterson.com. First attempt with it does not seem to work. TagCrowd.com Will take the RSS output from Yahoo. It has a customizable stop list, which will be needed to prune the junk from Yahoo (if I can’t get Yahoo Pipes to do the pruning). Takes awhile to get a personal stop list to show up in the pick list on the site. Image below is unfiltered by a stop list to show the problems. There is an embed HTML option, which would allow getting the cloud off their page — I assume it updates when the page loads. This is fairly promising. Google Docs spreadsheet. In the top cell put the function =ImportFeed(“http://news.google.com/?output=atom&#8221;). Then need to use Google’s word cloud gadget to make the rendering and publish the gadget and display on a web page (see below). Need this to refresh on a regular basis. An alternative would be to skip Twitter and use a Google Docs form. This avoids the need for Yahoo and for stop lists. It would still work with many mobile devices. Whats up with Google Docs? Google is moving to a new version of Spreadsheet. The new version does not support Gadgets (even Google’s own). The old version does, but its flaky. For today, the focus needs to be on the non-Google solutions. So, what about using Google Forms to fill a spreadsheet, publish it, take Yahoo Pipes to pick it up and feed it to TagCrowd? That seems like a reasonable next experiment. Moving from a laptop to the iPad is moving me into the cloud. The iPad is not a local storage device, so I don’t create documents there. I create them here, on the web, which means I’m naturally more focused on creating for the web. This realization, and a conversation today about how to organize our office study group (aka Design Circle) has me re-reading my previous post (a manifesto) for changing our unit’s web strategy. Our study group met today to look at Gary’s summary of the three broad strands of the curriculum we invented for ourselves two weeks ago. Gary suggested that we each might study within the three strands differently, or with different emphasis. In addition to the topical strands, we discussed a “course question” We didn’t nail down one question today. Perhaps with more time we can, or perhaps we should not, preferring instead to have personal questions that overlap, much as our roles and interests are personal but overlapping. And with our course questions in hand, what products do we anticipate creating as evidence of our learning accomplishments? Again, these are likely to be individual or small team. For example, Gary and I need to create a presentation for a conference April 28. And how will we assess our evidence of learning? Thinking about our study group, and the different member’s differing needs/desires/strategies for storing and sharing documents, I concluded that we are (or need to be) embarking on creating our Personal Learning Environments (PLEs) rather than a singular unit resource. But that makes a new problem, if we are a group of individuals, how do we do something as a collective unit? We probably also need a unit resource where we post to the web our various learning products. A common store could hold our work products, but what about our reading lists and recommended readings. We already have a group in Diigo for sharing bookmarks. I get a digest from there of what others have bookmarked, but have not gotten systematic at re-Diigo-ing the items that ring my chimes. The result is I’ve read something, but I can’t find it, so I can’t recommend and share it. This is the information about a bookmark in Diigo. Note that 3 people have saved this link. I also am guessing that we could combine the RSS from several Diigo users so that the common items (those with more than one “vote”) come through a filter. This would make a means to vote on the most important readings and a way to “de-clutter” the recommended readings that we are collectively sharing out. Over the course of the 2008-09 school year, colleagues and I at WSU were thinking about institution-based vs community-based learning models. A strong sample of that work is in our AAC&U presentation from April 2009. There are two charts that are important to our thinking, Learning Spectrum and Four Strategies. We think that changing to a community-based model will have an impact on how the university is organized. This year we got involved with the MacArthur Foundation/HASTAC Digital Media and Learning Competition as a result of looking for colleagues interested in ideas that could transform the university (and the Land Grant mission) in line with the thinking above (see our DML entry). Yesterday I ran into two related ideas that bring me back to thinking about these topics. “There are no magic solutions to the challenges our world faces. But there are millions of people around the globe who work each day to improve the lives of others. Unfortunately, there are millions more who don’t know how to meaningfully help [emphasis mine]. Perhaps thinking along parallel lines, Jane McGonigal’s TED talk: “Gaming can make a better world“ explored the idea that some of the traits gamers exhibit, including collaboration and a passion for the quest, could be tapped to work on some of the world’s problems. She ended by pointing to a game called Evoke that is trying to explore that hypothesis. Evoke encourages players to develop these skills: collaboration, courage, creativity, entrepreneurship, local insight, knowledge share, resourcefulness, sustainability and vision. Its a list that has more in common with ideas of Daniel Pink or the 21st century media literacies of Howard Rheingold than 20th century efforts like WSU’s Critical Thinking Rubric (not to fault it, but it comes from a Learning 1.0 context). I recognize Evoke’s list of skills in our thinking above about a transformed university. Vander Ark was Executive Director at the Gates Foundation and now he’s a partner in a private equity fund focused on innovative learning tools and formats. At the Gates Foundation he undoubtedly had a role in funding Gates’ bets on improving education, including strategies he lists based on people, schools, policy and community. Now he says he’s betting on a different strategy, one that seems to align with the projects and ideas outlined above. For awhile I’ve been stuck thinking about how these community-based learning could advance without leadership, or at least cooperation, from the university. I thought the university was a key player because it holds the ability to credential higher learning. And that credentialing power seemed to lock it into a dominant place in the marketplace. Recently, I came across an argument that some learners may not care about earning university credentials. The example was a person who owns a business and wants some business training (accounting, management, etc). For this person, the knowledge may be valuable, but the credential inconsequential. Evoke’s funding comes from the World Bank. Another funding model might be micro-lending. Kushal Chakrabarti, CEO, Vittana recently posted about Vittana’s new venture into micro-lending for student education loans. Could these ideas be combined? Could they offer a different path to education for some learners, bypassing the university’s credentialing? I want to start by thanking Jayme Jacobson and Eric Wegner for collaborating with me to create this service. Today I’m going to share a personal reflection that weaves together two stories in my life. One story is the process to charter and open Palouse Prairie School. The other story is from the work I do at WSU, exploring how technology is impacting learning. There is a place at the end of the program today for your response, but, in keeping with my WSU explorations, the text of my talk is also posted in my blog where you can comment. I’ll get back to why I blog. Driving back from Boise, I realized that I had failed to ask him what an angel was, and more importantly, how to get one. I think I know now what he meant by angel, in the sense of a financial angel or venture capitalist. Someone who would sweep in and solve the school’s financial problems. Such a person may yet exist for Palouse Prairie School, but in 2007 I didn’t know how to find an angel and so I needed to solve the school’s problem another way. What I found is a community of angels. The opposite of a community of angels is the story of the little red hen. Wikipedia summarizes the story as: Hen wants to make some bread and she asks the animals which of them will help sow the seed. At each stage, sowing, harvesting, threshing, grinding and baking the other animals decline to help Hen. In the end Hen does not share the bread with the farm animals. The story is used to teach the virtues of the work ethic and personal initiative. As you will see, I don’t think Hen lives in a community as I value it. The virtue I would teach children is that of a participatory gift economy, a community created of gift giving. Another aspect of the Hen story, that I’ve only recently considered, is that Hen knows how to solve her problem. Its a well-defined problem that just requires executing a series of steps. Despite the three inch manual from the Idaho Department of Education, starting a Charter school is not just executing a series of steps. Solving the School’s problem brings me to the other thread in this story. Solving a problem is the context for learning. Teachers know this, which is why they set problems for students. Some problems have answers in the back of the book, other problems are more ill-defined and set in larger contexts. For example, we see university students working on class projects in our community: designing, analyzing, planning. Expeditionary Learning would call these challenging problems an exploration into an unknown territory, where the challenge of traversing the territory becomes the teacher. What I have come to appreciate is the role of community in giving gifts needed to help solve ill-defined problems. Some of these gifts are monetary, but importantly, many are not. Some are skills. Some are enthusiasm and joining into the collective doing. Some are gifts of teaching and learning. I am calling the people who give these gifts the “small angels” who continue to help Palouse Prairie School. My title today is “Learning in a Community of Angels” because my joy comes from discovering a personal understanding of a community willing to contribute to my learning (our learning) along the road to solving a problem. This goes beyond my previous experience with community, the joy that comes from communal effort toward a common task. 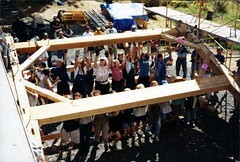 I’ve shared that joy with some of you at a barn raising. I now see Community is a learning resource. The angels (and there are many) are the people who make up the community. They have gifts to share, if you can learn to frame or re-frame your problem in ways that they can contribute. Rather than finding a big angel to solve the school’s problem, what I am learning is to value the gifts from small angels. But working with small angels requires setting up contexts in which gifts can be given. It involves working on your problem in public, telling your story, and then listening for the (sometimes unexpected) gifts. The gifts often come as teaching. It may be the introduction to another person and some hidden talent they have, or an introduction to a idea and its application. The key is to be open, and to accept a variety of help — to participate in what Cathy Davidson calls Collaboration by Difference — and let the community find the answer. We (not I) started Palouse Prairie School, and we, a collaborative community, are learning to make it thrive. I cited Wikipedia above. Wikipedia is an example of the work of many small angels. Jimmy Wales had the idea of getting an encyclopedia into the hands of every person on earth. To do so, he needed one that was very cheap. He needed volunteer experts to write it. Today Wikipedia has 1.74 billion words in 9.25 million articles in about 250 languages; 25 times the size of Britannica and growing. But size, or arguments about quality, are not my point here, rather, Wikipedia cleverly presents an invitation for small angels, with different purposes, knowledge, and goals, to collaborate toward a grand vision (even if they do not know or share the vision). Wikipedia is a Collaboration by Difference. Above, I said that I have blogged this sermon. I blog because of what I learned from George Hotz, the teenager who hacked the Apple iPhone. Hotz had a problem that required he defeat the corporate goals of Apple and AT&T to use his iPhone on the Sprint network. He blogged daily his steps in the process. Not in a vain-glorious way, but to elicit help from angels around the world. And the angels came, and commented in his blog, and provided money and other resources. Hotz’s strategy to work in public and learn from a community enabled him to solve his chosen problem. I welcome your comments today (or in my blog) in the same spirit, as gifts toward our shared learning. The joy I am sharing with you is one of community. Community created by a gift economy. Able to learn. Able to take collective action. In the opening words for today, by John Seely Brown, “We participate, therefore we are.” I want to encourage your giving, your learning, your collaboration, your making of our community. Months ago, when I proposed the topic of this talk, I had no thought that it would land in the middle of the UUCP pledge process. But I am happy that it does. I want to encourage you to join me in your willingness to give, monetary and otherwise, that creates this community of shared religious dialog. I want to encourage your giving that creates this community of Moscow. I am sharing my joy of experiencing and coming to understand that community is built not of our co-location, but of our gifts to one another. Gifts of sustenance or succor. Gifts of collective action and gifts of learning. Faculty weights differed markedly from the professionals’ results [see table 4 in the article]. Faculty considered category 2 (In the headline/lead combination, Is the message clear and compelling?) and category 4 (Does the news release use a convincing journalistic style?) the most important. Categories 1 and 5 received the lowest weighting. We have seen similar results in a course where we asked a group of faculty and a group of industry professionals to rate student work and also to rate the assignment used to assess the student work. In both examples, the faculty seem more focused on formalisms and the professionals on the aspects of the task that lead to practical success. I just sent a note to HuffingtonPost.com to explore how to get WWP news into their site. This offers some potential for high profile exposure for news about WWP successes, such as the recent Federal Court Order requiring the U.S. Fish and Wildlife Service to complete a status review as to whether the Big Lost River Whitefish deserves Endangered Species Act protection. Some of the news stories I read on HuffPost are ‘reprints’ that link back to the source’s website. What would be interesting to know is how to syndicate WWP news to HuffPost and bring readers back to the WWP site. A number of sites I visit have links near stories inviting users to use Digg, or other services to highlight stories. This is a way to promote one of the “teach Google” strategies, and it has the potential to raise the profile of WWP news pieces so that it show up better in searches. I don’t know the exact mechanism for adding this to WWP’s site, but I expect its fairly straight-forward. I use the social bookmarking tool Diigo, less popular that Delicious, but it has some group features that are more enhanced. If WWP were to adopt a social bookmarking tool it could be used to point at items across that web that were of interest to WWP members. Further, it would generate an RSS feed of those items that could be placed on the WWP site. The Diigo group mechanism would allow a collaborative effort in gathering these related links. The reason to do this, and the focus for it, would be to help build the community around WWP issues. A previous strategy I proposed was to find high ground (e.g., Wikipedia) and announce where a community could be found. There are some pointers to WWP’s work in Wikipedia, so I’ve been thinking more about how distributed and disaggregated communities actually are (I suppose this is a comment on how long the long tail is). A person like Stephen Downes reads, comments on, and synthesizes parts of what is going on in the community, but he does not get me in touch with all I find important. So, I think another part of the strategy is to make your own site rich in pointers to other parts of the community. The challenge is to do this without spending the amount of energy that Downes spends, hence the idea for a bookmarking/commenting group. Our own CTLT & Friends is beginning to get a little of this traction. Since there are several bloggers who write about WWP-related items, another part of the strategy should be to merge the RSS of their blogs (or some tags in their blogs) with the RSS from the bookmarking site to make a richer mix. Yahoo Pipes will do this with a fairly high degree of control. Finally, in thinking about what to do with new eyeballs arriving at the WWP site, I looked on VolunteerMatch.org. I’m not very familiar with that site, but am considering how WWP might use and post opportunities for volunteer efforts. For example, here is a potential example for a group of voluneteers — a mapping party. They are mapping an urban landscape, but WWP could use a similar approach. Do you have any insights that might help me sharpen this analysis?